The Dow was on track for a third day of losses Thursday as investors waited on a batch of earnings reports and searched for reasons to drive markets higher. U.S. stock futures were broadly weaker. That follows Wednesday's mixed markets close. 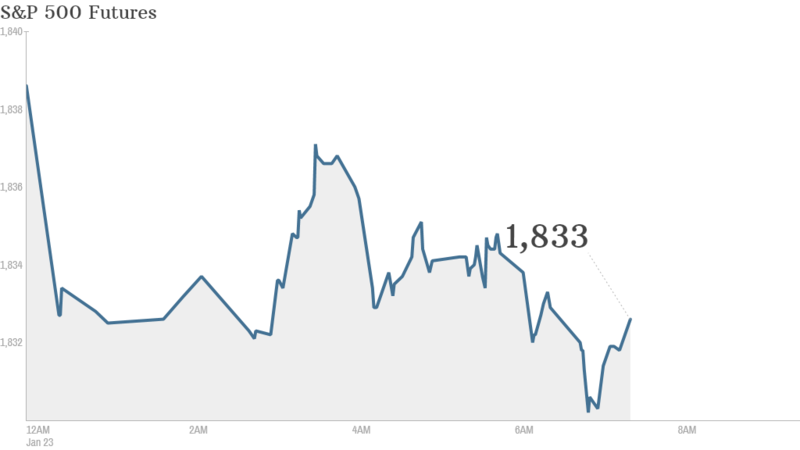 The Dow fell, while the Nasdaq and S&P 500 both ended with small gains. Stocks have been off to a rocky start in 2014 while bonds have outperformed. After last year's big rally, investors are looking for signs the economy will be strong enough to keep the bull market going. Things got rolling Thursday morning when cell phone maker Nokia (NOK) reported a bigger than expected loss and drop in sales, sending its shares lower. Microsoft (MSFT), which is in the process of buying Nokia, is set to report its results after the bell. In addition to results investors will be looking for information on its CEO succession plans. Fast food chain McDonald's (MCD) reported a modest gain in income but revenue that fell short of forecasts. Shares were slightly lower in premarket trading on the news. Starbucks (SBUX) is due to report in the after the bell. Shares of IBM (IBM) rose in premarket trading after it announced a deal early Thursday to sell part of its server business to Chinese computer maker Lenovo (LNVGF) for $2.3 billion. Shares of Netflix (NFLX) soared after the company reported its biggest gain in subscribers in a quarter in three years. Shares of eBay also continued to climb after investor Carl Icahn announced he would nominate two candidates for its board of directors, and submitted a non-binding proposal to spin out PayPal into a separate business. But Apple (AAPL) shares were slightly lower though after gaining Wednesday following Icahn's disclosure that he had increased his stake in the company by $500 million. European markets were mixed in morning trading, with France's CAC 40 up 0.2%. Germany's Dax turned the other way, slipping 0.2%. Asian markets notched sharp falls following a disappointing report on manufacturing activity in China. Hong Kong's Hang Seng Index dropped 1.5% and Korea's Kospi lost 1.2%. Japan's Nikkei closed down 0.8%.